Thoroughly clean all areas of the frog and sole using a hoof pick and a stiff brush. Use disposable gloves to apply enough product to cover the sole and sulci of the frog to a depth of 1/2 inch. For shod horses, place hoof down in sawdust to keep hoof packing in place. For barefoot horses, cover sole with paper or plastic, then cover entire hoof with self-adhering wrap. Replace every 24-48 hours until condition improves. For use under shoes and pads, apply product prior to nailing or gluing on pads and shoes. Excess product may be removed with isopropyl alcohol. 4 lb tub (12-14 applications) or tube of 6 individual applications. 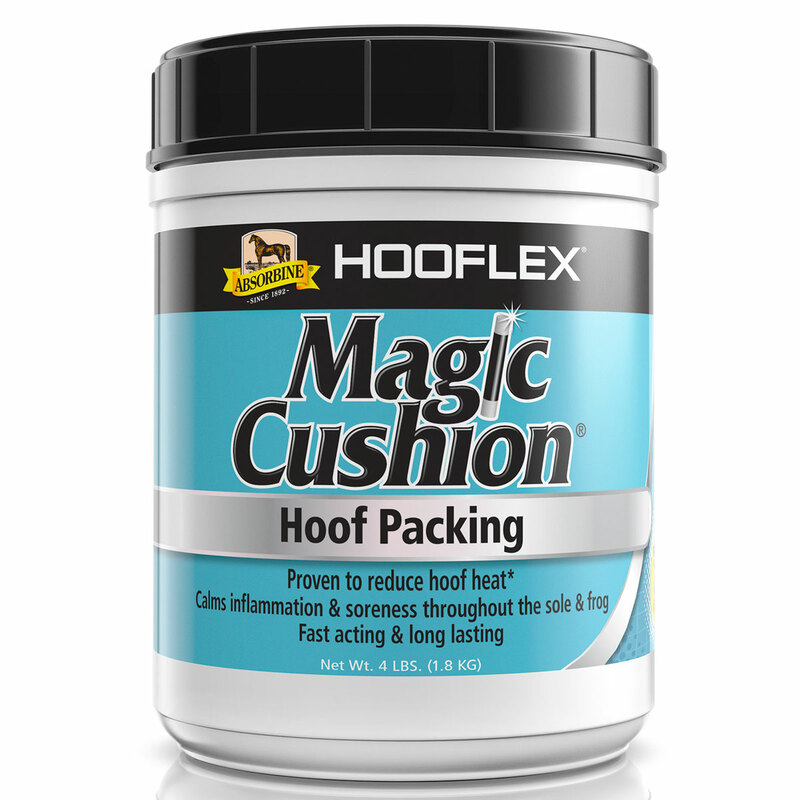 Magic Cushion Hoof Packing is rated 4.5 out of 5 by 61. Rated 5 out of 5 by EmilyH from Great product Love how easy this is to use and how well it stays in my horses hooves. I clean and dry the soles of my horses feet. Pack the goo in there and then press fine shavings over the top. No wrapping necessary. Rated 5 out of 5 by BeckettsMom from It's really Magic I use this all the time for pulled shoes, stone bruises or simply pack it in for a night when the ground is extra dry and hard. I have a sensitive OTTB with thin soles so this is a must-have for me. Rated 5 out of 5 by barnie from Works well & easy to use. I recently bought this product on the recommendation of a long time horseman who has successfully used this over the years. My horse had a bruised sole and this helped him recover well. Rated 5 out of 5 by Champ18 from LOVE IT! Bought this after a friend suggested it to relieve pain cause by a pretty bad case of thrush and loved it. My gelding had become so sore that he was visibly in pain just standing there, but within minutes of using magic cushion, I could see him returning to himself. Not only did it take away his pain, but it also healed his thrush, as well as bruises and abscesses since then. It healed his thrush in less then a week, after almost a month of trying to get rid of it. Love this product, and will continue to use it on my gelding to keep him happy, and his hooves strong! Rated 5 out of 5 by black pony from Works well and easy to use! This is so much nicer to use than the old hoof packing from decades ago. It is less stinky and easier to get into the hoof. I love being able to just pack some shavings on top and it all somehow holds together. It worked well resolving a bruise/possible abcess. I will have this in my tack box from now on. Rated 5 out of 5 by Sweet Sue from Seems to work great ! Noticed pain relief right away from my horse and his feet are doing much better since I switched to using this. The shipping was fast and it was the best price around ! Rated 4 out of 5 by JennJohns from Reduces heat in hoof I bought this a few weeks ago. My horse had one hoof that was significantly hotter then his other feet. My farrier swears by this product so I bought it. It seems to have worked well, reducing inflammation, or heat in the hoof. Rated 5 out of 5 by hertzk from Great to keep in the trunk at shows My horses front feet get sore, especially on different footing. 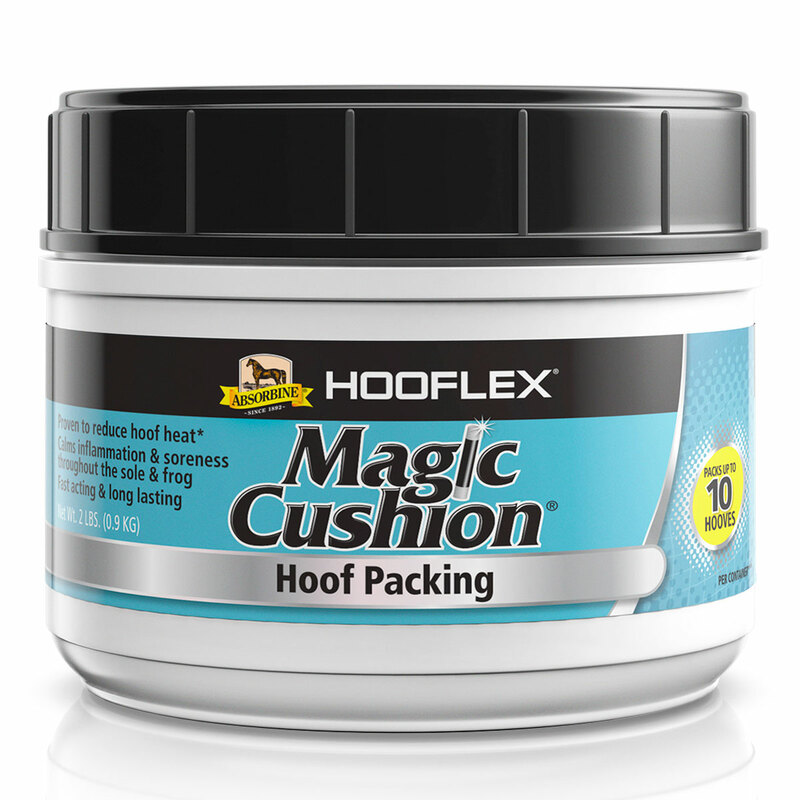 This is a great easy to use hoof packing to pack their feet at horse shows and have them feel great they next day. And not wrapping needed in the stall! Rated 1 out of 5 by alaventer from Not as great as I had hoped I bought this for my (then) newly barefoot TB. The first problem was the tub came in the mail on its side so the goop leaked out and had the whole box in a sticky mess, thankfully it didnt ruin my other purchases (farriers fix), so I had to use alcohol and many paper towels to get the goop off the side of the magic cushion and farriers fix bottle, then the application is super messy, it got all over my horse's pastern, super sticky with shavings covering his feet, and didnt stay in the frog crevices overnight like it was supposed to, I put plastic wrap over the Magic Cushion, vet wrapped, and then an equifit hoof packing tape over it (he was in a stall overnight) and it still oozed out and was not very effective at relieving his feet after a hard preliminary stadium course on packed ground. really disappointed. I'm now using Hawthorne's Sole Packs and am very satisfied with those. Rated 5 out of 5 by Vickie S from Awesome product Have use this for years when my horses get tender feet. Very sticky so you usually don't even have to wrap the hoof to keep the medicine in.